The Minister of State for Chemicals and Fertilizers Hansraj Gangaram Ahir, has urged upon Plastics processing industry to focus on R&D and innovations and promised support of the Government for its sustainable growth. 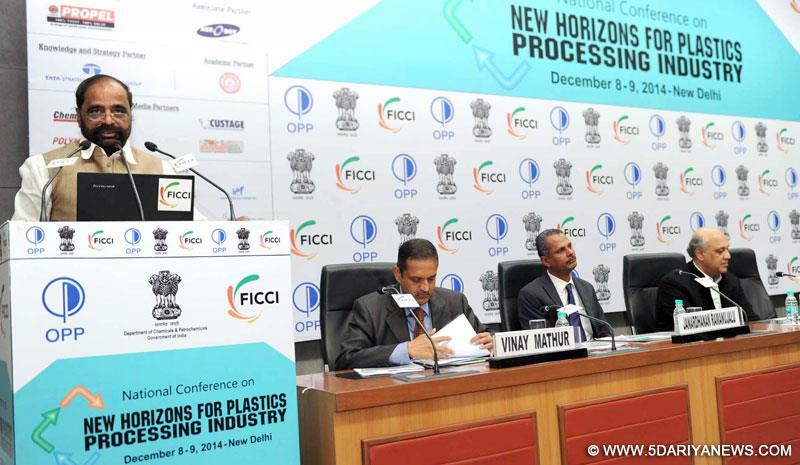 Inaugurating a National Conference on “New Horizons for Plastics Processing Industry” in New Delhi today, he said Plastics Parks set up by the Central Institute of Plastics Engineering and Technology (CIPET) should be taken advantage of. The conference is being organised jointly by FICCI and Organization of Plastics Processors of India with the support of Department of Chemicals and Petrochemicals, Government of India. In his welcome address, Sh.Sidarth Birla, President FICCI, highlighted the vital role being played by the Indian Plastics Industry in national economy as also the opportunities and challenges in the sector. He appreciated the special thrust being laid by the Government on manufacturing and infrastructure, which are imperative for job creation and inclusive development. In this context he lauded the Make in India campaign and felt the same along with other initiatives will lead to 7-8% GDP growth in next 12-18 months. Surjit Kumar Chaudhary, Secretary, Department of Chemicals and Petrochemicals in his special address, advocated for sustainable growth of the plastics industry, taking due care of environmental concerns and its waste management. A Knowledge and Strategy Paper on Indian Plastic Processing Industry prepared by FICCI with the help of Tata Strategic Management Group was released on the occasion. The study analyses the role and potential of the Indian plastics processing industry. It indicates that the penetration of plastics in agriculture globally is 8% whereas in India it is substantially lower at only 2%. This indicates that the agriculture sector could be one of the major segments which drive the growth of plastics in coming years. The two day conference will focus on various issues relating to further growth and prospects for Plastics industry in the country.